Preheat oven to 140°C/280°F. Season ox cheeks with salt and sear both sides in a large pot over medium-high heat with some vegetable oil. Remove ox cheeks from pot and set aside. Dice onions, chop garlic, and cube carrots and celery root. Add vegetables to the pot and cook until browned. Return ox cheeks to the pot. Deglaze with Madeira and red wine, and let reduce. Add juniper berries, bay leaves, and allspice to the pot. Pour beef stock over and season with pepper. Transfer to oven and bake for approx. 4 hrs. Remove ox cheeks from the braising liquid and let cool. Drain the vegetables with a sieve over a pot. Reduce the sauce. Portion the cooled ox cheeks and return to the sauce. Peel lemons and dice the peel. Finely chop parsley. Slice garlic and add to a frying pan with olive oil. Heat up slowly and fry until garlic slices become golden brown and crispy. Remove garlic chips from the oil and let drain on paper towels. Set aside. Add parsley and lemon peel to the hot garlic-olive oil and briefly fry. Remove from heat. Fill piping bag with celery root purée. 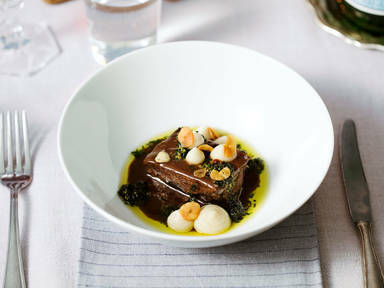 Serve the ox cheeks in the sauce with gremolata, and top with garlic chips and celery root purée. Enjoy!